Tom has been into biking for a long time. My interest in it has only developed recently and is still limited (let’s just say there is no way in hell you’ll see me out on the roads doing a long ride). A few years ago I bought a Brompton folding bike thinking it would be easy to take along and small enough for me to manage. A year later, Tom also bought a Brompton. They are perfect camping bikes. Folded up, our two Bromptons fit in the leg space behind the seats of our Subaru. We carry a basket and two bags with us so that we can have repair gear, lunch and our dog along when we bike. 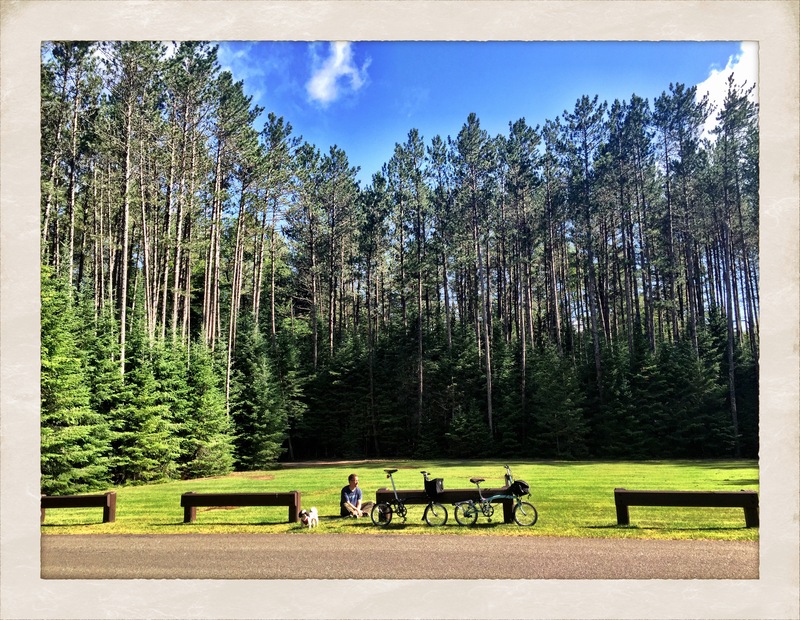 They are perfect for utility biking around many camps (bike to the shower, ride bikes to check out the sites) and for longer rides when we find rail trails along the way.